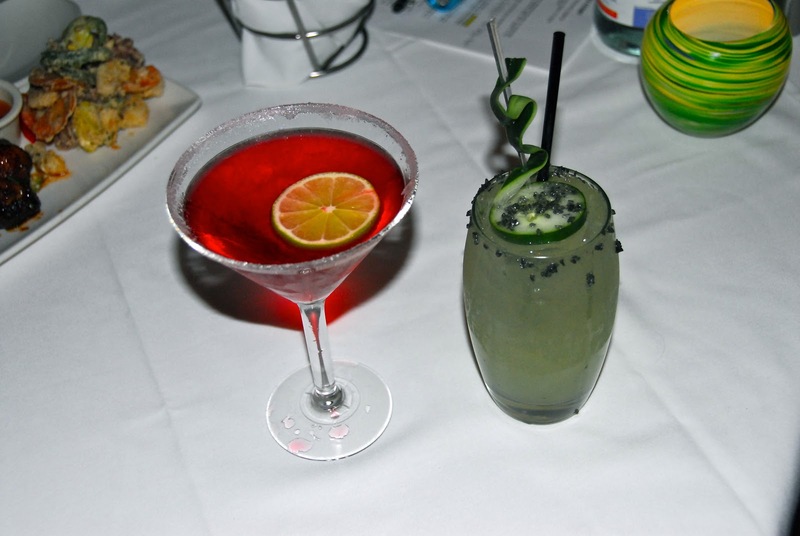 The Weekend Gourmet Dines Out December spotlight is Chart House at Tower of the Americas, a San Antonio landmark that provides a lot of bang for your buck! It features delicious food, but it also boasts stunning nighttime city views. 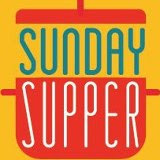 This restaurant is perfect for anyone looking for a romantic evening or someplace to celebrate a special occasion. 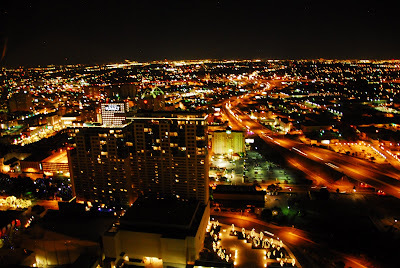 As you dine 75 stories above Downtown San Antonio, the lights are low, the food is upscale and delicious, and the nighttime city views are amazing! During the course of your meal, the restaurant rotates, giving you an ever-changing view of the city lights. The Chart House, which is part of the Landry's Restaurant Group, recently hosted Michael and I for dinner to enjoy many of their signature items – from cocktails and appetizers to dessert. Chart House is known for its excellent seafood and prime rib, and we tried many of their most popular menu items during our visit. We arrived and immediately noticed how festively the Tower of Americas is lit for the holidays! The base was green, and the top was colored with bright primary colors. 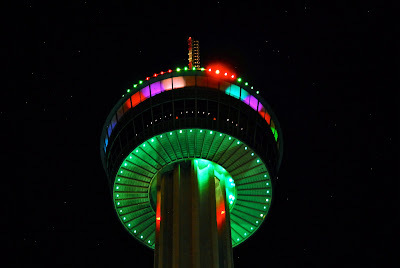 We checked in with a hostess inside the Tower of Americas lobby, then we took an outdoor elevator up to the restaurant. I’m a little afraid of heights, but even I was amazed by the views as we ascended up the side of the building! Once we arrived at the restaurant, we were warmly welcomed by the staff and quickly escorted to our beautiful window table. The lights were dim, and the atmosphere was sophisticated and elegant. We started out with cocktails – a sweetly tart pomegranate martini for me – while the chef prepared samplers of six different appetizers for us to try. One platter contained Calamari and Friends (fried calamari, jalapenos and sweet potato), Maple Glazed Quail, and Fried Asparagus that was topped with tomatoes and an addictive blue cheese butter. The other platter contained Crab Avocado & Mango Stack, Roasted Red Pepper and Edamame Hummus with Plantain Chips, and East Meets West Tuna. All of the appetizers were delicious, but our two favorites were the sweet-spicy quail and the fried asparagus. The quail was like eating an upscale version of chicken wings -- tender and so flavorful! The fried asparagus were perfectly crispy, and that blue cheese butter topping was totally addictive! 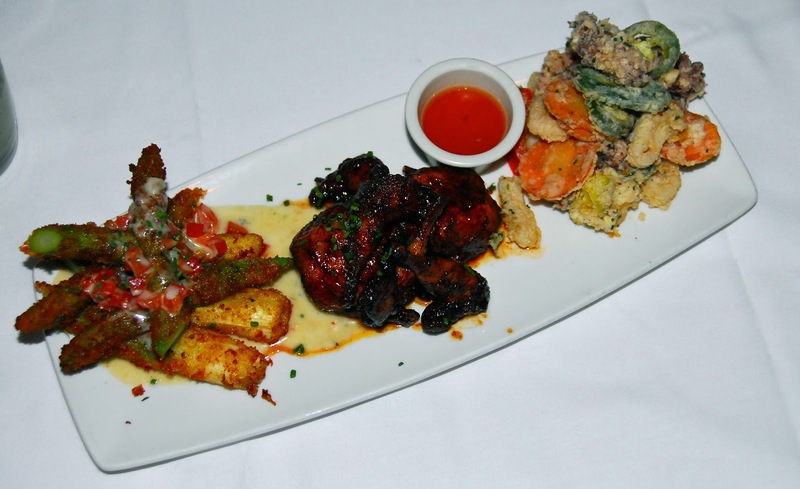 Appetizer Sampler #1 featured fried asparagus, sweet-spicy quail, and fried calamari. 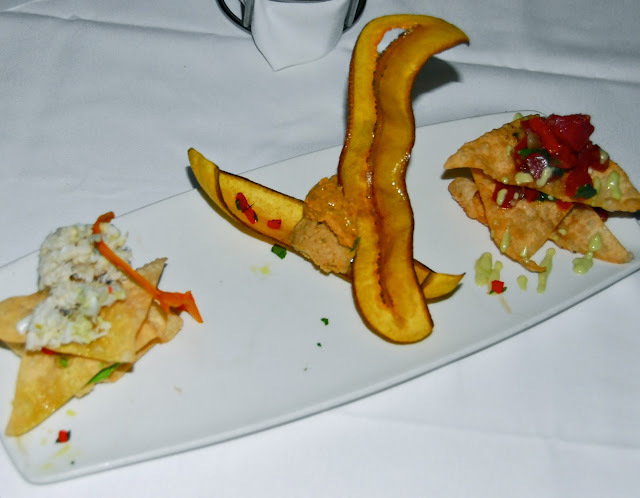 Appetizer Sampler #2 featured a crab stack, edamame with plantain, and rare tuna with wasabi and wonton crisps. While we waited for our entrees to arrive, we enjoyed a really nice Fall salad: Pear and Saga Salad. It contained baby greens, red onions, Bosc pears, tomatoes, Saga blue cheese, and glazed pecans. It had so much vibrant flavor going on. After we finished our salad, the table was cleared. 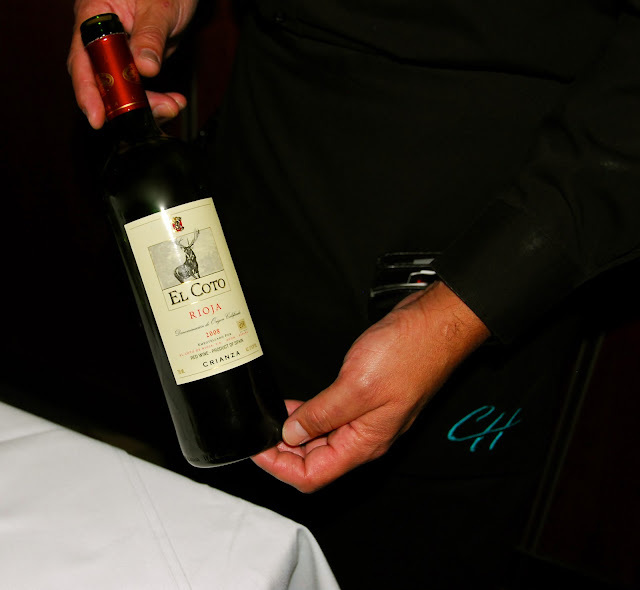 We settled in to enjoy our entrees, which were paired with a really nice bottle of Spanish rioja, El Coto, Crianza. It paired very nicely with all of the entrees we sampled. 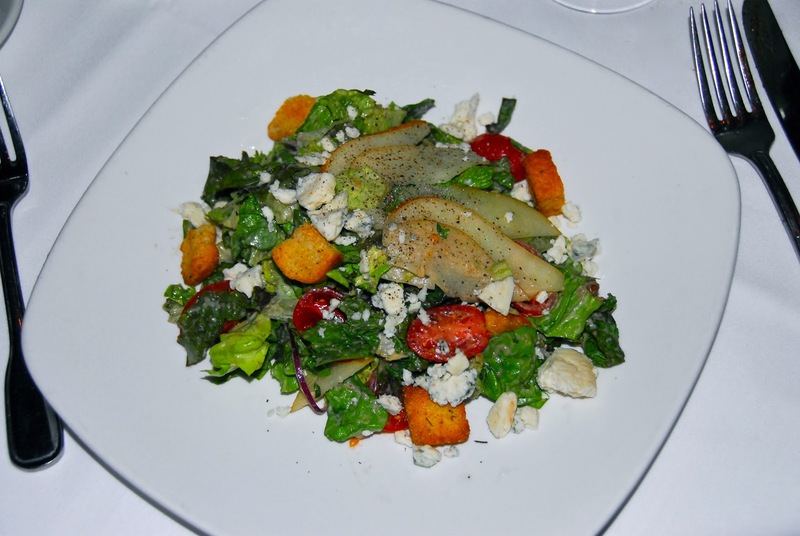 A fabulous Fall salad flavored with Bosc pears and Saga blue cheese. If you've never tried rioja, give this Spanish red wine a try! 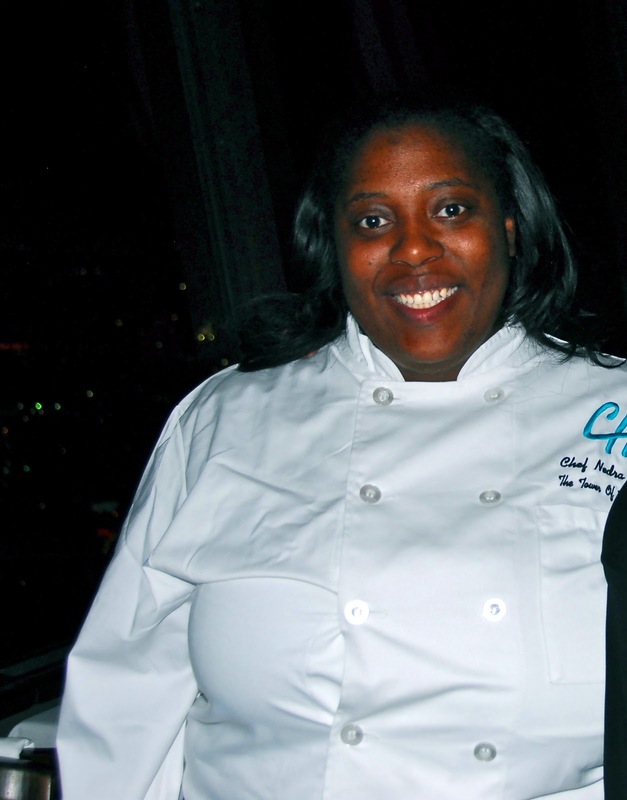 We enjoyed three different entree selections, courtesy of the talented Chef Nedra. First up was the Mixed Seafood Grill, which is a perfect way to try a variety of their grilled seafood items. The platter included garlicky shrimp scampi, a delicious lump crab cake, and salmon topped with citrus sauce. 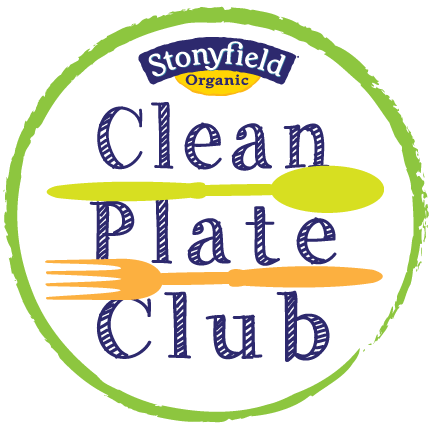 We especially enjoyed the creamy citrus sauce with the salmon, as well as the perfectly made crab cake. We also tried a Chef Special that was created just for us: Seared Salmon with Avocado Pico de Gallo. The salmon was cooked perfectly, and the pico’s heat was balanced by the addition of a generous amount of creamy avocado. 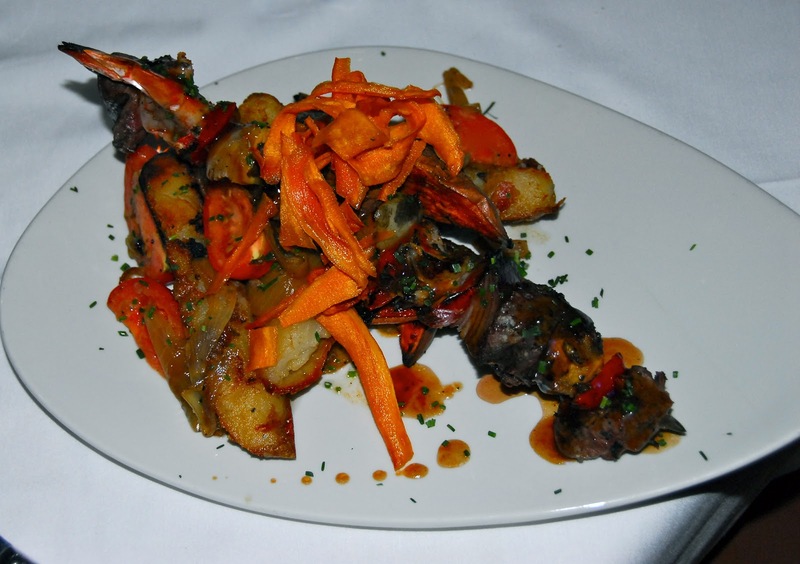 Our third entrée selection was a Surf and Turf Skewer: chunks of juicy prime rib, jumbo shrimp, and veggies. The meat was juicy and delicious, and the shrimp were sweet. The skewer was served over crispy fried potatoes. 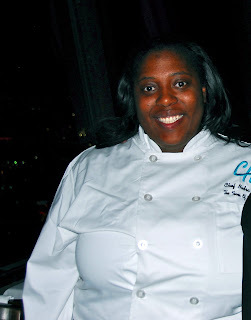 Chef Nedra came out from the kitchen several times to talk with us and see how we were enjoying the food. Not only is she a talented chef, she's very engaging and friendly! Can't decide? 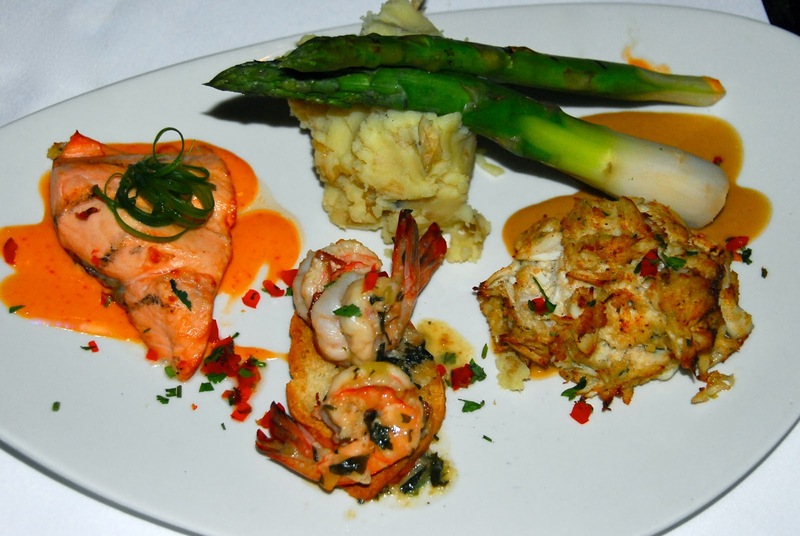 Pick the Mixed Seafood Grill and try three fabulous grilled seafood dishes! 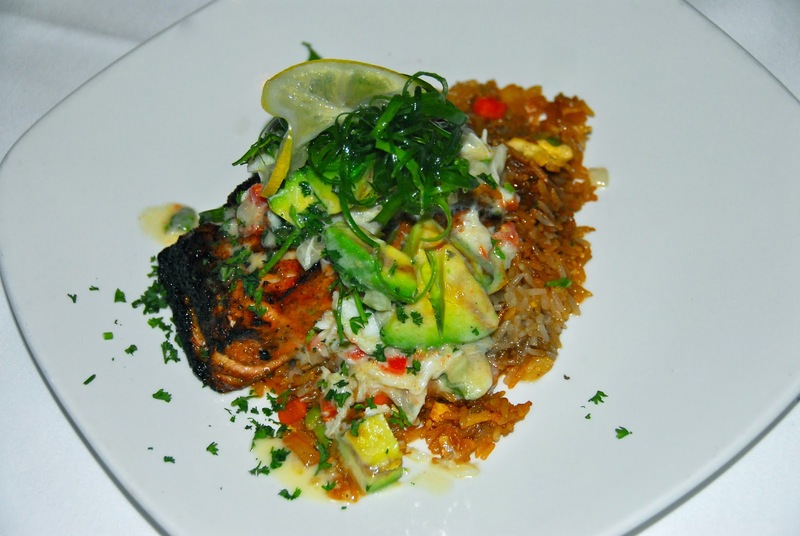 Seared salmon...served over rice and topped with avocado pico de gallo. The best of BOTH worlds: Surf and Turf Skewer. giving you an ever-changing view as you dine! While we ate, we enjoyed fabulous views of San Antonio below! The festive holiday decorations on the Riverwalk made the view even more colorful and festive. There are fewer things better in life than dressing up a bit and enjoying a special evening with that special someone…while drinking fabulous wine and eating some delicious food! Before we knew it, it was time for dessert. 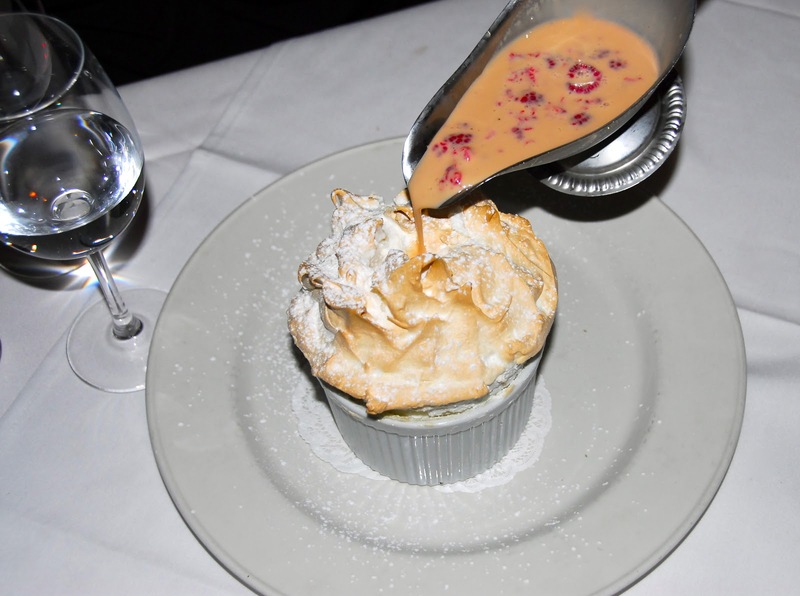 We shared two of their signature desserts items: Chart House Souffle with Raspberry Sauce and Hot Chocolate Lava Cake. The soufflé came out first, and it was amazing…light and fluffy, with an orange backnote from the addition of Grand Marnier. The raspberry sauce paired perfectly with the soufflé. 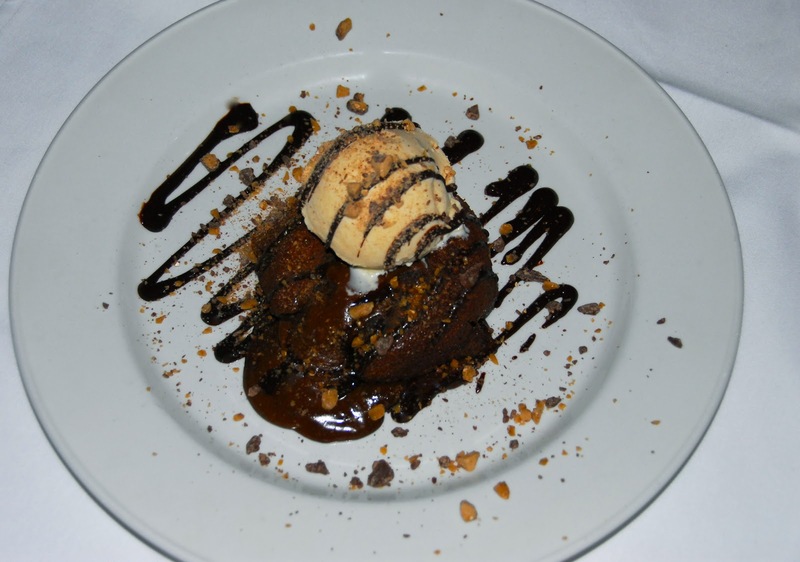 After we finished the soufflé, out came the lava cake. OMG…this is one over-the-top dessert. I mean that in the best way possible! It was intense chocolate from Godiva liqueur, chocolate sauce, vanilla ice cream, and a garnish of Heath Bar crunch. We were getting pretty full by then, but we couldn’t stop eating this cake. Check out that lovely view in the background! After dessert, we snapped a few more pictures of the restaurant and the views below. Then it was time to jump back into the elevator and head back downstairs. A quick note: parking outside Tower of the Americas is abundant and well lit. It is a paid parking lot, so make sure to bring a little bit of cash with you. Chart House at Tower of the Americas is a fabulous restaurant for holiday dining or any special occasions you have coming up. I think it's one of the most romantic places to dine in San Antonio. Not dining for two? No worries, the restaurant is family-friendly as well. The staff we met was all fabulous, including our server. He was very attentive and friendly, helping us pick selections from their extensive menu. 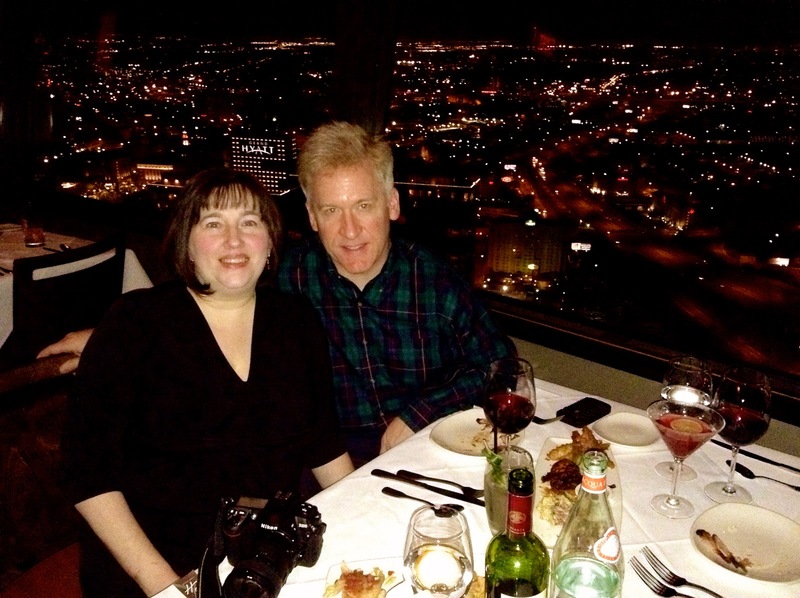 As you can see from the smiles on our faces…and the beautiful San Antonio view behind us…we had a fabulous time! 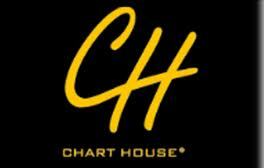 If you plan to dine at Chart House, reservations are recommended. Their reservation line is 210-223-3101. Disclosure: Chart House provided us with a complimentary meal to facilitate this post. As always, the opinions expressed are my own. 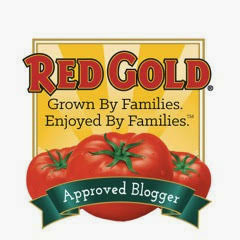 Photographs are copyrighted by Michael K. Garcia and may not be reproduced without permission.